Have you ever driven along on your merry way and then see something that totally floors you? Sure, it could be a car accident of some sort, a pretty lady or man, the lineup at Anton's or a properly observed 4-way stop in Richmond. For me at least, I usually stop dead in my tracks when there is a new restaurant. 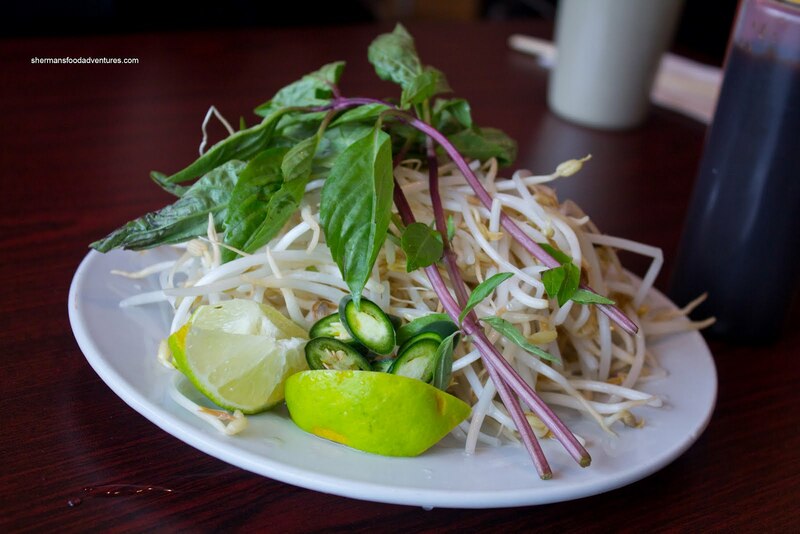 Now imagine one that serves sushi and pho? Uh... Well, that has happened before with Japolo Sushi (which surprisingly turned out well). 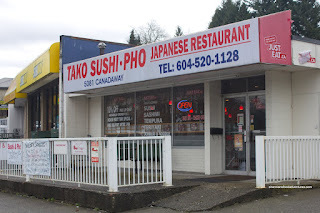 Now there is another called Tako Sushi & Pho on Canada Way. Actually, it would be hard for me to stop dead in my tracks here since the location is pretty awkward to get in a nd out of (especially if you were traveling Westbound). So I finally made it out there along with Big D and Slick for some multi-cuisine action. Unluckily for me, they both had Pho which made for a lack of diversity. Well, that is why I ended up ordering a combo consisting of a California Roll and Sashimi. Well, it was a California roll. *Yawn* There was nothing amiss with it other than the bland and slightly dry rice. It was edible and non-offensive. I was impressed with the look of the Sockeye Salmon and Tuna Sashimi. The colours were good and it looked fresh. That would be true with the salmon as it was sweet and had a nice texture. Not for the tuna though, I found it mushier than usual (as tuna is mushy already). Of course I had to also try a bowl of Pho too. Unfortunately, they do not receive a passing grade on it. First of all, the portion size was not very large. Most other places would be a half-size larger. Furthermore, the broth was bland with no impact at all (the little that was provided). At the very least, the meats and noodles were okay. Big D and Slick pretty much had the same problem with their bowls too. They were neither good nor a great value. Unlike Japolo Sushi, Tako does not succeed in meshing the 2 cuisines together. 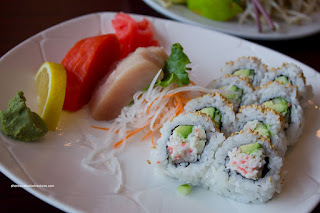 Although the sushi was not bad, it wasn't great either. 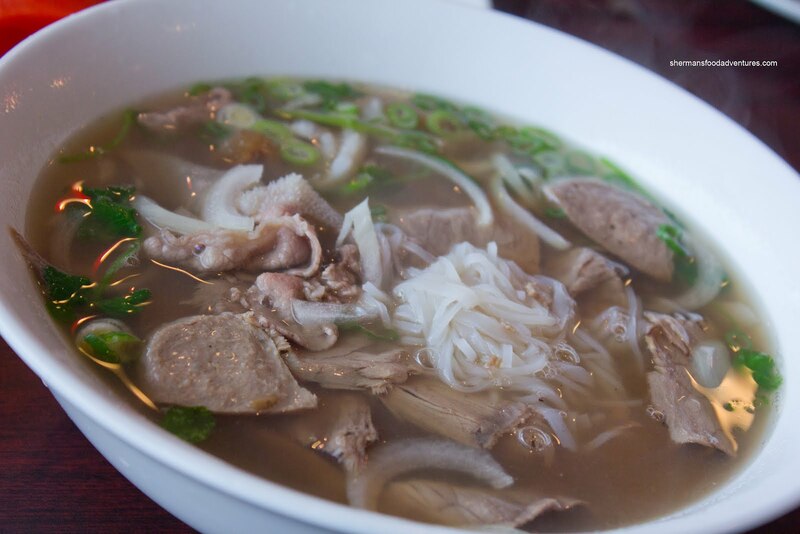 As for the Pho, well, you already got the idea. This place has turned into some Indian restaurant now. @shokutsu Thanks for reminding me. I actually passed by it a few days after and it said it was changing. I can't say I'll miss it!